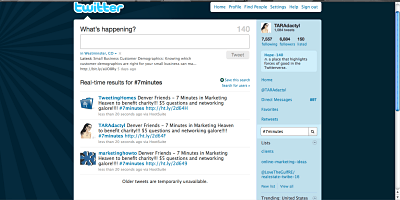 Social media marketing with twitter events is an easy and FREE way to get your event message out there AND to let your attendees know about what is going on in and around your venue. Whenever I tell my clients and workshop attendees about this they always think that there is something they have to sign up for in able to be able to take advantage of twitter. Not so. All you need to do is let your sponsors and attendees know that you are going to use #eventname. That is the pound sign or hash tag plus your shortened event name. In the case of the last big event I spoke at, the abbreviation used was #affcon. If you had done a search for that on twitter you would have found a sort of running commentary of what is going on at your venue from attendees who like to use Twitter. Please note, if you would like to find out who is tweeting you MUST do it within a couple of days as Twitter and search.twitter.com do not archive tweets for long after the event. So, we are having a charity event called 7 Minutes in Marketing Heaven. This is a two part event, one in Colorado in July and one in Florida in August. I will use the same tag #7minutes for both events and will encourage people at the event to “tweet” about it when they are there. Most small business owners are not involved in Twitter on this level so they do not think about using this marketing channel. BUT, just because you are not interested in it does not mean that it cannot help grow your event!